Wesley Greenhill Lyttle is thought to have been born near Newtownards, County Down, in 1844. (His second forename is often given as "Guard" but this is an error, as is shown by the probate of his will and published legal notices. An accountant, a teacher of shorthand, an elocutionist, Lyttle was above all an entertainer, often in the guise of his alter-ego “Robin”, a jovial country farmer who regaled his audiences in Ulster-Scots. Lyttle had been a lecturer in Dr Corry’s Irish Diorama Company, which toured Britain, and America with a show entitled “Ireland, its scenery, music and antiquities”. For most of the 1870s he lived in Belfast where he began to write and perform his humorous monologues. 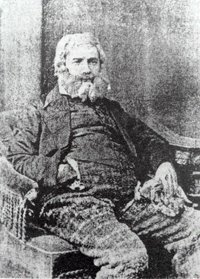 In 1880 he established the North Down Herald in Newtownards. In 1883 Lyttle moved the newspaper to Bangor and added the title of Bangor Gazette. Much of Lyttle’s work was published in serial form, popular at the time (Dickens at once comes to mind). This was not totally uncritically accepted: the novelist Margaret Oliphant questioned “the violent stimulant of weekly publication with its necessity for frequent and vapid recurrence of piquant incident and startling situation.” Succinctly, an author would end each instalment with a “cliff hanger” simply to tempt the reader to buy the next issue. He wrote two further novels, Sons of the Sod and Daft Eddie or the Smugglers of Strangford Lough (another serial). He regularly performed at various public events as “Robin Gordon of Ballycuddy”.